S-(+)-Norfenfluramine (SNF)—an active metabolite of the now-banned anorexigen fenfluramine—has been implicated in the drug's appetite-suppressing actions and its life-threatening cardiovascular side effects. SNF reduces appetite through serotonin 5-HT2C receptor activation; it causes cardiopulmonary side effects through 5-HT2B receptor activation. Thus, we attempted to identify molecular determinants of SNF binding to 5-HT2B receptors distinct from those underlying SNF-5-HT2C/2A receptor interactions. Mutagenesis implicated Val2.53 in SNF binding to 5-HT2B receptors. Ligand docking simulations suggested both Val2.53 γ-methyl groups form stabilizing van der Waals' (vdW) interactions with the α-methyl group of SNF. A V2.53L mutation induced a 17-fold decrease in affinity; molecular dynamics (MD) simulations suggested that this decrease resulted from the loss of one 2.53-α-methyl group vdW interaction. Supporting this, 1) the binding of norfenfluramine (NF) analogs lacking an S-(+) α-methyl group (RNF and α-desmethyl-NF) was less sensitive to the V2.53L mutation, and 2) a V2.53A mutation decreased SNF affinity 190-fold, but decreased RNF and α-desmethyl-NF affinities only 16- and 45-fold, respectively. We next addressed whether the α-methyl group of SNF contributes to 5-HT2C/2A receptor affinity. Removal of the α-methyl group (RNF and α-desmethyl-NF), which reduced 5-HT2B receptor binding 3-fold, did not affect 5-HT2C/2A receptor binding. An α-ethyl substituent (α-ethyl-NF), which decreased 5-HT2B receptor affinity 46-fold, reduced 5-HT2C and 5-HT2A receptor binding by 14- and 5-fold, respectively. Finally, we determined that residue 2.53 affects SNF potency and efficacy at 5-HT2B receptors but not at 5-HT2C and 5-HT2A receptors. In conclusion, vdW interactions between residue 2.53 and the α-methyl group of SNF contribute to the ligand's 5-HT2 receptor subtype-selective pharmacology. Serotonin (5-hydroxytryptamine, 5-HT) is a biogenic amine that regulates a broad spectrum of processes in both the central nervous system and in the periphery via no fewer than 15 plasma membrane receptors divided into seven families (Kroeze et al., 2002, 2003). All but one family belong to the class A, rhodopsin-like G protein-coupled receptor super-family. The 5-HT2 family of receptors, comprising the 5-HT2A, 5-HT2B, and 5-HT2C subtypes, represents one of the best characterized groups of 5-HT receptors (Roth et al., 1998; Kroeze et al., 2002). These receptors are the major targets/sites of action of atypical antipsychotic medications (Meltzer, 1989; Roth et al., 2004), most hallucinogens (Glennon et al., 1984; Roth et al., 2002; Nichols, 2004), and some appetite suppressants (Moses and Wurtman, 1984; Neill and Cooper, 1989; Vickers et al., 2001). The appetite suppressant fenfluramine, which is very effective in the treatment of obesity (Weintraub et al., 1992), was withdrawn from the U.S. marketplace because of its association with valvular heart disease (VHD) (Connolly et al., 1997). Fenfluramine was also known to be associated with pulmonary hypertension (PH) (Pouwels et al., 1990; Brenot et al., 1993; Connolly et al., 1997; Simonneau et al., 1998). Fenfluramine-induced VHD and PH result from the activation of mitogenic 5-HT2B receptors on heart valve and pulmonary artery interstitial cells (Fitzgerald et al., 2000; Rothman et al., 2000; Launay et al., 2002; Setola et al., 2003), leading to the formation of proliferative fibromyxoid plaques that compromise tissue integrity and function (Steffee et al., 1999; Tomita and Zhao, 2002). Fenfluramine-induced anorexia, in contrast, seems to be mediated by activation of hypothalamic 5-HT2C receptors (Vickers et al., 2001; Heisler et al., 2002). Thus, novel anorexigens that activate 5-HT2C receptors and are devoid of 5-HT2B receptor activity are expected to be safe and effective treatments for obesity; the elucidation of 5-HT2B receptor-unique SNF-receptor intermolecular interactions could facilitate the rational design of such 5-HT2C receptor-selective agents. In the present report, we identify residue 2.53 in 5-HT2 receptors as playing an important role in the subtype selective in vitro pharmacology of S-(+)-norfenfluramine (SNF). Site-directed mutagenesis, SNF and NF congener binding studies, molecular modeling, and ligand docking and MD simulations all suggest that both terminal methyl groups of Val2.53 in the 5-HT2B receptor form stabilizing van der Waals' (vdW) interactions with the α-methyl group of SNF. In addition, we provide functional data demonstrating that these interactions are also important for SNF-mediated activation of the 5-HT2B receptor. We also present evidence that the role of residue 2.53 on SNF binding to, and activation of, the 5-HT2B receptor is unique among 5-HT2 receptors. Receptor Constructs and Site-Directed Mutagenesis. The human 5-HT2A, 5-HT2B, and 5-HT2C (INI editing isoform) receptors having been described previously (Rothman et al., 2000) were subcloned into the NotI site of pUniversal-Signal, a pIRES-neo (BD Biosciences Clontech)-based expression vector containing the following elements: a Kozak sequence followed by a cleavable membrane targeting sequence, followed by a FLAG epitope tag, all in frame with each other (Bhatnagar et al., 2004). Site-directed mutagenesis was performed using the QuikChange kit (Stratagene, La Jolla, CA) according to the manufacturer's instructions. Mutagenized receptor cDNAs were sequenced by automated, PCR-based sequencing (Cleveland Genomics) to verify the introduction of the desired mutation and the absence of PCR-induced mutations. Chemical Synthesis of Norfenfluramine. Analog α-desmethyl-NF (2-[(3-trifluoromethyl)phenyl]ethylamine hydrochloride) was prepared by condensation of 3-(triflurormethyl)benzaldehyde and nitromethane in the presence of ammonium acetate. The crude product was purified by Kugelrhor distillation (90°C at 1 mm Hg) to give a semisolid material. Although the nitrostyrene has been reported to be a solid (Menicagli and Samaritani, 1996), the product failed to crystallize. Reduction of the nitrostyrene intermediate with lithium aluminum hydride in dry tetrahydrofuran afforded a 47% yield of the target compound as its free base after Kugelrohr distillation. The hydrochloride salt was prepared and recrystallized from 2-propanol (m.p., 100°C). Structure assignment was consistent with proton NMR data, and the hydrochloride salt analyzed (Atlantic Microlab, GA) to within 0.4% of theory for C, H, and N. Dengel et al. (1975) have previously prepared the free base of α-desmethyl-NF. Branch et al. (2002) have reported the synthesis of the hydrochloride salt (using a different route of synthesis) in the patent literature, but the salt was characterized only by low-resolution mass spectrometry. The α-ethyl homolog of NF has been mentioned only once before (Fuller et al., 1982), and this report described only the pharmacology of the agent, not the synthesis or physicochemical characterization. The α-ethyl homolog, 1-[(3-trifluoromethyl)phenyl]-2-aminobutane hydrochloride, was prepared by a method similar to that employed for the synthesis of α-desmethyl-NF. The condensation step used nitropropane in place of nitromethane to produce the nitrostyrene; the latter was converted to the oily free base of the target amine by lithium aluminum hydride reduction, purified by Kugelrohr distillation to obtain a 53% yield of the product, and converted to its hydrochloride salt (m.p., 161–163°C after recrystallization from 2-propanol). The assigned structure was consistent with proton NMR data, and the salt analyzed (Atlantic Microlab, Norcross, GA) to within 0.4% of theory for C, H, and N.
Chemicals. Optically pure S-(+)- and R-(–)-NF were provided by Richard B. Rothman (National Institute on Drug Abuse, Baltimore, MD). LSD, pergolide, dihydroergotamine, serotonin (5-HT), and α-methyl-5-HT were all purchased from Sigma-Aldrich (St. Louis, MO). Cell Culture and Transfection. Human embryonic kidney 293T cells were maintained at 37°C, 5% CO2 in 75-cm flasks (Costar, Cambridge, MA) with Dulbecco's modified Eagle's medium containing 100 mM sodium pyruvate, 100 U/ml penicillin, 100 μg/ml streptomycin (DMEM) and 10% fetal bovine serum (DMEM/10% FBS) (all from Invitrogen, Carlsbad, CA). At confluence, cells were trypsinized, harvested, and split 1:5 into four 10-cm plates containing 10 ml of DMEM/10% FBS (for transfection), and one 75-cm flask containing 15 ml of DMEM/10% FBS (for cell maintenance). One day after seeding into 10-cm dishes (Costar) (i.e., at ∼90% confluence), the medium was removed and replaced with 10 ml of OptiMEM (Invitrogen). Each 10-cm plate was transfected with 24 μg of receptor plasmid using Lipofectamine 2000 (Invitrogen) exactly as specified by the manufacturer. Twenty-four hours after transfection, cells were processed for either radioligand binding assays or inositol phosphate accumulation assays as described below. Radioligand Binding Assays. Twenty-four hours after transfection, the medium was removed and replaced with DMEM containing 5% dialyzed FBS (Invitrogen). After 24 h, the cells were incubated overnight in serum-free DMEM. The next day, the cells were harvested by scraping, pelleted, and resuspended in lysis buffer (50 mM Tris-HCl, pH 6.9). The membranes were then pelleted by centrifugation and, after removal of the supernatant, the membrane fraction was frozen at –80°C (if not used immediately). Radioligand binding assays were set up in 24 wells of a 96-well plate (1 ml/well capacity) as follows: 25 μlof10 μM[3H]LSD (PerkinElmer Life and Analytical Sciences, Boston, MA), 25 μl of membrane pellet that had been resuspended in 700 μl of ice-cold binding buffer (50 mM Tris-HCl, 5 mM MgCl2, and 0.5 mM EDTA, pH 7.4), 25 μl of vehicle (binding buffer) or 10× test compound dissolved in binding buffer (i.e., SNF, RNF, α-desmethyl-NF, α-R,S-(±)-ethyl-NF, 5-HT, α-methyl-5-HT, dihydroergotamine, or pergolide) at various concentrations spanning 7 orders of magnitude (two wells/concentration), and 200 μl of binding buffer, such that the final [3H]LSD and test compound concentrations were 1×. Reactions were equilibrated in the dark for 1 h at room temperature (∼22°C), and then receptor-ligand complexes were harvested by vacuum filtration onto Whatman (Florham Park, NJ) GF/C filters (presoaked in 0.3% polyethylenimine), then washed three times with ice-cold 50 mM Tris-HCl, pH 6.9, using a Brandel 24-well harvester. The filters were dried overnight, and each was added to a 6-ml vial, into which 4 ml of EcoScint liquid scintillation cocktail (National Diagnostics, Atlanta, GA) was then added. The total [3H]LSD binding present on each filter was quantified by liquid scintillation counting using a PerkinElmer Wallac (Gaithersburg, MD) liquid scintillation counter. The log KD (for LSD) or log Ki (for all other compounds) and Bmax values were determined using Prism 4.0 (GraphPad Software, San Diego, CA) by fitting the average total [3H]LSD binding (in disintegrations per minute) from several independent experiments, plotted as a function of the log [compound], to a homologous (for LSD) or heterologous (for all other compounds) competition model that takes into account ligand depletion (GraphPad) and shares the log KD or log Ki among all data sets. Inositol Phosphate Accumulation Assays. Twenty-four hours after transfection, cells in 10-cm plates were harvested by trypsinization and resuspended in 25 ml of DMEM, 5% dialyzed FBS, and seeded (1 ml of cell suspension/well) in a 24-well poly-l-lysine-coated plate. The next day, the medium was removed and replaced with BME (Invitrogen) containing 1 μCi/ml [myo-3H]inositol (PerkinElmer Life and Analytical Sciences) (500 μl/well). Twenty-four hours later, the medium was replaced (1 ml/well) with 1× Hanks' balanced salt solution (Invitrogen) containing 25 mM sodium bicarbonate, 11 mM glucose, and 10 mM LiCl (inositol phosphate buffer). Agonists (5-HT, SNF, and RNF) were diluted in inositol phosphate buffer to 100× and added (10 μl/well) to the cells. After a 1-h incubation at 37°C, the buffer was removed and replaced with 1 ml of 1 mM formic acid to extract the cytosolic fraction. The [3H]-inositol phopshates accumulated in the cytosol were isolated by loading the cytosolic fraction onto Dowex anion exchange resin (formate form) columns, washing the columns twice with water (first with 2 ml/column, then with 10 ml/column), then washing with 10 ml of wash buffer (5 mM sodium borate and 50 mM sodium formate)/column, and finally eluting with 10 ml of elution buffer (100 mM formic acid and 200 mM sodium formate)/column into 30-ml vials containing 10 ml/vial 3a70B liquid scintillation cocktail (Research Products International, Mt. Prospect, IL). [3H]Inositol phosphate accumulation in each sample was quantified by liquid scintillation counting using a PerkinElmer Wallac liquid scintillation counter. The log EC50 and Emax values were determined using Prism 4.0 (GraphPad) by fitting the average total [3H]inositol phosphate from several independent experiments, plotted as a function of the log [agonist], to a three-parameter logistic equation (sigmoidal concentration-response) and sharing the log EC50 and Emax among all data sets. Modeling, Ligand Docking Simulations, and Molecular Dynamics Simulations. Three-dimensional models of the human 5-HT2B, 5-HT2A, and 5-HT2C receptors were constructed using our rhodopsin-based (Palczewski et al., 2000), refined, validated 3-D homology model of the rat 5-HT2AR (Shapiro et al., 2002) as a template. The raw sequence of each receptor was first fit onto the template using the DeepView (GlaxoSmithKline, Research Triangle Park, NC) modeling program's Magic Fit function, then uploaded to the Swiss Model server (http://swissmodel.expasy.org//SWISS-MODEL.html). The returned Protein Data Bank files were loaded into Sybyl 6.91 modeling and MD software (Tripos, Inc., St. Louis, MO) and, after atom typing and calculation of charges, energy-minimized using the Powell method under an AMBER7 FF99 force field with an 8-Å nonbonded cut-off and a distance-dependent dielectric constant of 4. The local minimum was identified using a Wolfe line search for successive iterations that differed by less than 0.05 kcal/mol · Å. Ten such models were generated, and the structures were averaged, resulting in an apo receptor model. 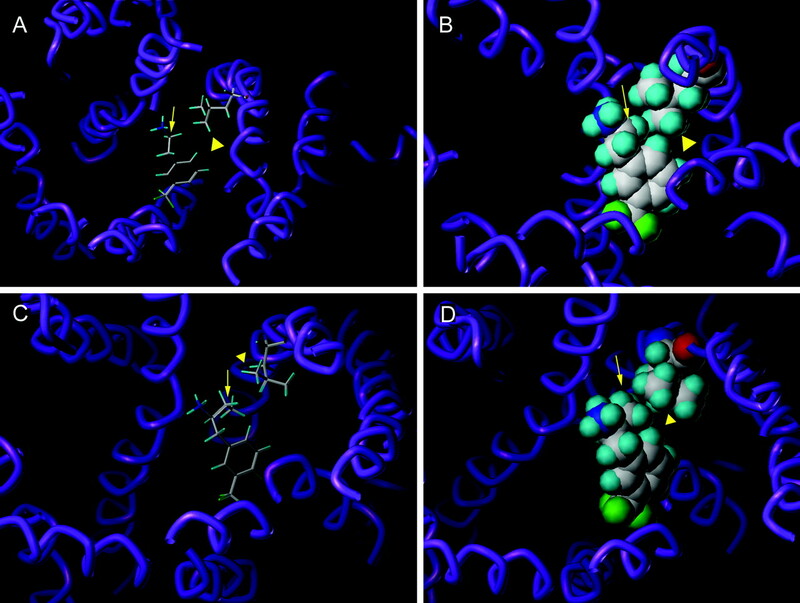 To generate a reference structure for ligand docking simulations, 5-HT was manually placed in the interhelical space of the 5-HT2B receptor model according to three conserved features of 5-HT binding the receptor: 1) the protonated amine was 2 to 3 Å away from Asp3.32, 2) the 5′-OH of the ligand was 2 to 3 Å away from Ser3.36, and 3) the aromatic moiety was near the “aromatic box” delineated by Trp3.28, Trp6.48, Phe6.51, and Phe6.52 (Roth et al., 1997; Manivet et al., 2002). To open up the binding pocket, the receptor side chains within 6 Å of the manually docked 5-HT were energy minimized as above. The interatomic distances in the resulting structure were in good agreement with previous descriptions of biogenic amine ligand binding to 5-HT2-family receptors (Roth et al., 1997; Kristiansen et al., 2000; Shapiro et al., 2000; Manivet et al., 2002). The ligand was then extracted from the minimized receptor, which was used as the receptor description file for the simulated docking of SNF and RNF by the FLEXX module of Sybyl6.91 (Tripos, Inc.). 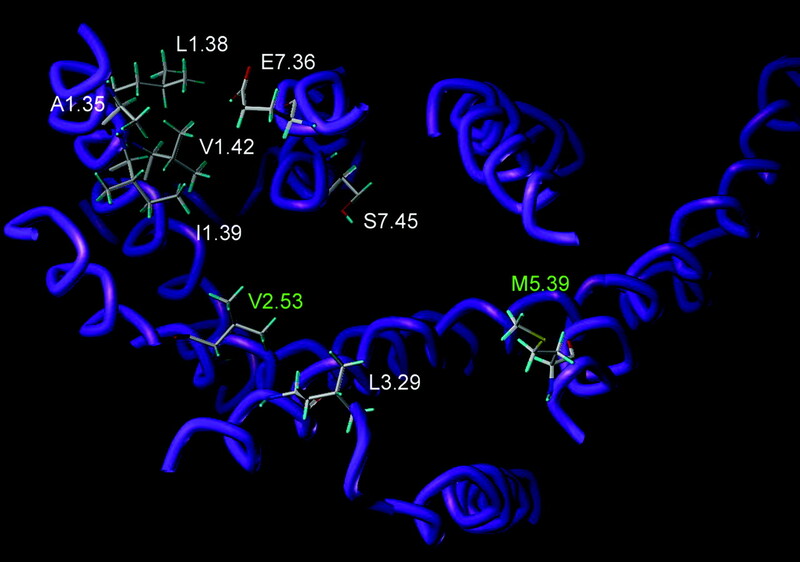 The ligand binding site was defined as those residues within 6 Å of Asp3.32. Only those solutions that were consistent with the conserved features described above were retained for consideration. To explore the possible effects of a mutation on SNF or NF analog binding, the mutation was computationally introduced into selected ligand docking simulation solutions, and 10 rounds of computer-simulated annealing (CSA) were performed to explore possible side chain orientations relative to the bound ligand. Docked solutions bearing the mutation to be studied were heated to and held at 700 K for 1 ps, then cooled (0.5 K/fs) to 200 K during a 1-ps interval using an exponential temperature-versus-time ramping method. Snapshots were taken every 5 fs. During the MD simulations, the distance between the protonated amine group of the ligand and the nearest carboxylate oxygen of Asp3.32, the ligand atoms, and the α-carbon backbone of the receptor, and all atoms greater than 8 Å away from the mutated side chain were constrained. For MD calculations during CSA, an AMBER7 FF99 force field was applied with an 8-Å nonbonded cut-off and a distance-dependent dielectric constant of 4 using a nonbonded cut-off. The resulting structure from each round of CSA was examined with regard to the orientation of the mutated residue's side chain relative to the ligand. Effect of Point Mutations on Ligand Affinity. To identify residues involved in the subtype selective binding of the anorexigen SNF to 5-HT2 family receptors, we constructed every possible 5-HT2B-to-5-HT2C/2A receptor mutant residing near a putative ligand binding pocket. To do so, we first generated a molecular model of the human 5-HT2B receptor by homology model building using our bovine rhodopsin-based (Palczewski et al., 2000), refined, validated 3-D homology model of the rat 5-HT2A receptor (Shapiro et al., 2002) as a template. To verify that our rhodopsin-based model was similar in predicted structure to the published coordinates of bovine rhodopsin (Palczewski et al., 2000), we superimposed our 5-HT2B receptor homology model onto 1HZXA (the bovine rhodopsin PDB file). All absolutely conserved transmembrane helix residues aligned and were oriented very similarly relative to each other (data not shown). We next identified putative ligand binding residues in the 5-HT2B receptor (i.e., those residues in the extracellular half of the transmembrane helices that have their side chains oriented into the interhelical space) that were not conserved in linear alignments of the 5-HT2 receptor transmembrane helices (Fig. 1). We then measured the affinity constant (Ki) of SNF at wild-type and point mutant 5-HT2B receptors in which one nonconserved, putative ligand binding residue was mutated to its 5-HT2C and/or 5-HT2A receptor analog. As shown in Fig. 2A and Table 1, only the V2.53L and the M5.39V mutations caused a decrease in SNF affinity: the V2.53L (5-HT2B/2C-to-5-HT2A) mutation decreased SNF affinity 17-fold, whereas the M5.39V (5-HT2B-to-5-HT2C/2A) mutation led to a 10-fold decrease in ligand affinity. The two mutations in tandem decreased SNF affinity 37-fold (Table 1). Because Val2.53 was predicted by our model to reside in the putative binding pocket, we chose to investigate further its potential, direct role in the 5-HT2B receptor-selective binding of SNF. p values were obtained from F tests comparing curve fits of competition binding isotherms for two receptors. Where applicable, values are presented as mean ± S.E. In the 5-HT2C receptor, residue 2.53 is valine. However, the V2.53L mutation in the 5-HT2C receptor caused only a 9-fold decrease in SNF affinity (i.e., half the decrease caused by the mutation in the 5-HT2B receptor) (Fig. 2B and Table 1). The inverse L2.53V mutation in the 5-HT2A receptor had no effect on SNF affinity (Fig. 2C and Table 1). Thus, the role of residue 2.53 in SNF binding to 5-HT2 receptors is subtype-selective; it is most important in the 5-HT2B receptor, of moderate importance in the 5-HT2C receptor, and not at all important in the 5-HT2A receptor. This mirrors the rank order of potency of SNF at the 5-HT2 family receptors (i.e., Ki = 22, 170, and 1900 nM, respectively). To ensure that the apparent decrease in SNF affinity caused by the V2.53L mutation did not result from altered affinity for the radioligand ([3H]LSD), we measured the Ki of LSD at wild-type and V2.53L 5-HT2B receptors. As shown in Fig. 3, A and B, and Table 2, the V2.53L mutation had little effect on LSD affinity. Indeed, none of the mutations studied herein altered LSD affinity by more than 2-fold (Fig. 3, Table 2, and data not shown), suggesting that none of the mutations dramatically alters receptor folding/topology. We also examined the effect of the V2.53L mutation on four other 5-HT2B receptor agonists: 5-HT, α-methyl-5-HT, dihydroergotamine, and pergolide (Fig. 3, A and B, and Table 2). The V2.53L mutation had less or no effect on the binding of the other agonists assayed; the largest effect was a 5-fold decrease in affinity for dihydroergotamine (Fig. 3B and Table 2). The preceding observations demonstrate that the V2.53L mutation markedly and uniquely affects SNF binding to 5-HT2B receptors. Average Bmax values, fit directly and adjusted for radioligand specific activity and protein content, were as follows: WT, 3.7 ± 0.7 pmol/mg; V2.53L, 9 ± 2 pmol/mg; V2.53A, 7 ± 1 pmol/mg; V2.53I, 2.4 ± 0.2 pmol/mg. Where applicable, values are presented as mean ± S.E. Modeling, Ligand Docking Simulations, and MD Simulations of Ligand Binding to 5-HT2B Receptors. To investigate the possible atomic interactions by which Val2.53 in the 5-HT2B receptor contributes to high-affinity SNF binding, we performed ligand docking simulations. Each of the 30 solutions generated was inspected to determine whether 1) the protonated amine nitrogen of the ligand was close enough to Asp3.32 to form the conserved, anchoring ionic interaction and 2) whether the aromatic group of the ligand was near one or more of the conserved aromatic residues known to stabilize biogenic amine ligand binding (Choudhary et al., 1993; Roth et al., 1997; Manivet et al., 2002). Only 16 of the 30 docked structures met the first criterion (i.e., the protonated amine nitrogen of the ligand was less than 3.0 Å away from one of the carboxylate oxygens of Asp3.32). Of these, only two placed the ligand close enough to Val2.53 for the latter to have an affect on SNF affinity, as was indicated by our mutant receptor binding data (Fig. 4, A–D). The lower energy solution (solution 1, total score =–10.58 kcal/mol) placed the α-methyl group carbon of SNF 3.73 Å and 3.76 Å away from the terminal γ-methyl group carbons of Val2.53 (Fig. 4, A and B). The other solution (solution 2, total score = –10.48 kcal/mol) placed the α-methyl group carbon of SNF 3.68 Å and 4.57 Å away from the terminal γ-methyl group carbons of Val2.53 (Fig. 4, C and D). To determine which of the two solutions was best able to explain our mutagenesis data, we computationally introduced the V2.53L mutation into each solution, and then did 10 rounds of computer-simulated annealing (CSA) to examine several possible orientations of the V2.53L side chain relative to the ligand (Fig. 4, E–H). For the solution 1-based MD simulations, the average distances ± S.E.M. between the terminal δ-methyl group carbons of V2.53L and the α-methyl group carbon of SNF in the 10 lowest energy structures were 3.35 ± 0.05 Å and 4.6 ± 0.1 Å (Fig. 4, E and F). We compared the V2.53L terminal δ-methyl group-ligand α-methyl group intercarbon distances with those between the terminal γ-methyl group carbons of Val2.53 and the α-methyl group carbon of SNF in solution 1 (i.e., 3.73 Å and 3.76 Å). Assuming that favorable vdW methyl group-methyl group interactions occur at intercarbon distances of 3 to 4 Å, our MD simulations suggested that the net effect of the V2.53L mutation resulted from the loss of a stabilizing vdW interaction between the 2.53 side chain and the α-methyl group of the ligand. For solution 2-based MD simulations, the V2.53L terminal δ-methyl group-ligand α-methyl group intercarbon distances ± S.E.M. were 3.57 ± 0.05 Å and 4.71 ± 0.09 Å (Fig. 4, G and H). Comparing these receptor side chain-ligand intercarbon distances with those between the terminal γ-methyl group carbons of Val2.53 and the α-methyl group carbon of SNF in solution 2 (3.58 Å and 4.57 Å) revealed very little difference. Therefore, solution 2 did not predict a change in the number of stabilizing vdW interactions between the 2.53 side chain and the α-methyl group of SNF upon mutation of Val2.53 to leucine. Thus, in relation to the V2.53L mutation, solution 1 best modeled our experimental observations. A 3-D molecular model of the human 5-HT2B receptor showing putative ligand binding residues that are nonconserved among 5-HT2 family receptors. Side chains shown by mutagenesis and radioligand binding assays to be involved in SNF binding are labeled in green; those shown not to affect SNF binding are labeled in white. Atom color code: white, carbon; blue, nitrogen; red, oxygen; cyan, hydrogen; and yellow, sulfur. The α-carbon backbone of the seven helices is shown in purple. See Materials and Methods for details regarding generation of the model. As for Met5.39, in none of the 30 solutions was the residue predicted to be close enough to SNF to directly influence ligand binding. Furthermore, in none of the MD simulations was the Met5.39 side chain predicted to be within less than 4 Å of bound SNF. Nevertheless, our data demonstrate a role for Met5.39 in SNF binding that our current model suggests is indirect. To further test the predictive power of our model, we performed identical MD simulations and analyses after introducing a conservative V2.53I mutation into solution 1 (Fig. 5). The average distances ± S.E.M. between the terminal γ- and δ-methyl group carbons of V2.53I and the α-methyl group carbon of SNF in the 10 lowest energy structures were 3.91 ± 0.05 Å and 3.8 ± 0.1 Å, respectively. Comparing these values with those for the terminal γ-methyl group carbons of Val2.53 and the α-methyl group carbons of SNF in solution 1 (3.73 Å and 3.76 Å) revealed very little difference. Thus, solution 1 predicted that the conservative V2.53I mutation would not alter vdW interactions with the α-methyl group of SNF. Based on these predictions, we made the V2.53I mutant receptor and measured its affinity for SNF, which we expected to be similar to that of the wild-type receptor. As predicted by our model, the affinity of the V2.53I mutant receptor for SNF was not altered by the mutation (Table 1). Solution 1, therefore, accurately modeled the effects of both the V2.53L and the V2.53I mutations. It is interesting that the V2.53I mutation did decrease 5-HT and α-methyl-5-HT affinity by approximately 10-fold, whereas the affinity for DHE, pergolide, and LSD (the radioligand) were affected less than 3-fold by the mutation (Fig. 3C and Table 2). Representative competition binding isotherms for SNF at wild-type and mutant 5-HT2 receptors. The percentage total binding of ∼1 nM [3H]LSD remaining in the presence of the indicated concentration of SNF is shown for WT, V2.53L, and M5.39V 5-HT2B receptors (A), WT and V2.53L 5-HT2C receptors (B), WT and L2.53V 5-HT2A receptors (C), and WT and V2.53I 5-HT2B receptors (D). Data are presented as the mean ± S.E. of at least three independent experiments measured in duplicate. To obtain log Ki values from these data, the data were fit to a heterologous competition model of radioligand binding to one class of receptor sites that takes ligand depletion into account (GraphPad Prism 4.0). Nonspecific radioligand binding never exceeded 20% of the total radioligand binding. Assuming that the R-enantiomer of norfenfluramine binds in the same orientation as SNF, our model suggested that the α-H of RNF would appose Val2.53 and that the α-methyl group would project `down' into the interhelical space, away from Val2.53. Hydrogen atoms, because of their smaller atomic radius, are less efficient than bulkier methyl groups at forming attractive vdW, and the α-H of RNF would be more than 4 Å away from Val2.53; therefore, our model predicted that RNF would bind to the wild-type 5-HT2B receptor with a lower affinity than SNF. As shown in Table 3, RNF displayed a 3-fold decrease in affinity compared with SNF at the 5-HT2B receptor. Furthermore, because the R-(–) α-methyl group of RNF would be more than 4 Å away from Val2.53 and therefore unlikely to form stabilizing vdW interactions, our model predicted that the V2.53L mutation would have a smaller effect on RNF affinity than it did on SNF affinity. As shown in Table 3, the affinity for RNF was decreased only 3-fold by the V2.53L mutation, compared with a 17-fold decrease in SNF affinity caused by the mutation. We also measured the affinity of the wild-type and V2.53L mutant 5-HT2B receptors for α-desmethyl-NF. As shown in Table 3, α-desmethyl-NF, like RNF, exhibited a 3-fold reduction in affinity for the 5-HT2B receptor compared with SNF. The affinity for α-desmethyl-NF was reduced 5-fold by the V2.53L mutation (Table 3)—a reduction very similar to that observed for RNF, suggesting that the decrease in RNF affinity caused by the V2.53L mutation did not result from altered interactions with the α-methyl group. The affinity of the NF analogs lacking an S-(+) α-methyl group (RNF and α-desmethyl-NF) was very similar to that of SNF at the V2.53L 5-HT2B receptor, suggesting a lack of productive interactions between the V2.53L side chain and the α-methyl group of SNF. Our model, however, suggested that the V2.53L side chain forms one vdW interaction with the α-methyl group of SNF. As such, we would have expected the V2.53L 5-HT2B receptor to have lower affinity for α-desmethyl-NF than for SNF. To investigate potential interactions between the V2.53L and α-desmethyl-NF, we replaced the α-methyl group of SNF with a hydrogen atom in our V2.53L 5-HT2B receptor model, then performed computer-simulated annealing to explore several possible orientations of the V2.53L side chain relative to α-desmethyl-NF. The results of our MD simulations predicted that in the absence of an S-(+) α-methyl group, at least one of the terminal δ-methyl groups of V2.53L was close enough to the α-carbon of α-desmethyl-NF to form a stabilizing vdW interaction (Fig. 6, A and B). With SNF docked, however, the V2.53L side chain was predicted to be oriented such that only one of the terminal δ-methyl groups apposed the ligand—an orientation that accommodates the S-(+) α-methyl group (Fig. 4, A and B). Thus, our MD simulations provided a plausible explanation for the lack of difference in SNF and α-desmethyl-NF affinity at the V2.53L 5-HT2B receptor: removal of the S-(+)-methyl group, with which one of the V2.53L terminal δ-methyl groups forms a stabilizing vdW interaction, allows V2.53L to project into the binding pocket, permitting a stabilizing vdW interaction between a V2.53L terminal δ-methyl group and the α-carbon of α-desmethyl-NF. Given our mutagenesis data and modeling predicting that the α-methyl group of SNF is within4Åof Val2.53, we hypothesized that an α-carbon substituent bulkier than a methyl group (i.e., an ethyl group) would reduce NF binding to the wild-type 5-HT2B receptor. As shown in Table 3, α-R,S-(±)-ethyl-NF exhibited a 46-fold lower affinity for the wild-type 5-HT2B receptor compared with SNF. According to our model, the reduction in affinity caused by the α-ethyl substitution was most probably caused by 1) steric hindrance between the α-ethyl group of the ligand and Val2.53 or 2) the adoption of a different binding orientation caused by nontolerance of the α-ethyl group by Val2.53. In either case, our results with α-R,S-(±)-ethyl-NF corroborated our model implicating interactions between the α-methyl group of SNF and the γ-methyl groups of Val2.53 in the ligand's high-affinity binding to 5-HT2B receptors. At the V2.53L 5-HT2B receptor, α-R,S-(±)-ethyl-NF affinity was disrupted less than 2-fold compared with SNF. Because leucine is bulkier than valine, we had initially predicted the V2.53L mutant 5-HT2B receptor to be more sensitive to the bulkier α-carbon substituent of α-R,S-(±)-ethyl-NF. To explore possible rationales for the lack of differences between SNF and α-R,S-(±)-ethyl-NF affinity at the V2.53L 5-HT2B receptor, we replaced the α-methyl group of SNF with an ethyl group in our model and then performed computer-simulated annealing to explore several possible orientations of the V2.53L side chain relative to the α-ethyl group. As depicted in Fig. 6, C and D, our MD simulations predicted the V2.53L side chain and the α-ethyl group of the ligand to be oriented such that one V2.53L terminal δ-methyl group could form a favorable vdW interaction with the α-carbon-proximal methylene group of the α-ethyl substituent; the terminal methyl group of the α-ethyl substituent projected down into the binding pocket, away from the V2.53L side chain. Thus, our MD simulations suggested that for SNF, α-desmethyl-NF, and α-R,S-(±)-ethyl-NF binding to the V2.53L 5-HT2B receptor, the V2.53L side chain forms one stabilizing vdW interaction with each, consistent with the observation that the compounds have similar affinity (Table 3). If indeed the decrease in SNF affinity in the V2.53L mutant was caused by the loss of one stabilizing vdW interaction between the 2.53 side chain and the α-methyl group of SNF—and not steric hindrance as a result of the bulkiness of the V2.53L side chain—we expected that a V2.53A mutation would result in the loss of two stabilizing vdW interactions and, thus, an even larger decrease in SNF affinity than that caused by the V2.53L mutation. To test this prediction, we made the V2.53A mutant receptor and measured its affinity for SNF. As shown in Fig. 7 and Table 1, and as predicted by our model, the V2.53A mutation caused a dramatic 190-fold decrease in SNF affinity. The affinities of other agonists were altered much less by the V2.53A mutation (Table 2), suggesting an SNF-specific effect. These observations strongly suggest that the effect of the V2.53L mutation on SNF affinity was most probably caused by a decrease in vdW stabilization rather than steric hindrance. Having established the importance of interactions between Val2.53 and the α-methyl group of SNF in ligand binding to 5-HT2B receptors, we sought to determine whether the α-methyl group of SNF contributes to the ligand's binding to 5-HT2C and 5-HT2A receptors. To do so, we measured the affinity of the SNF analogs RNF, α-desmethyl-NF, and α-R,S-(±)-ethyl-NF at the two receptors. As shown in Table 3, the affinities of α-desmethyl-NF at the 5-HT2C and 5-HT2A receptors were not different from SNF and RNF affinities, suggesting that the α-methyl group of SNF does not contribute significantly to ligand binding to those receptors. In contrast, NF analogs lacking an S-(+) α-methyl group (i.e., RNF and α-desmethyl-NF) exhibited a 3- to 4-fold reduction in binding affinity at wild-type 5-HT2B receptors, reflecting productive receptor-S-(+) α-methyl group interactions. The affinities of the 5-HT2C and 5-HT2A receptors for α-R,S-(±)-ethyl-NF were reduced by 14- and 5-fold, respectively, compared with SNF; the wild-type 5-HT2B receptor exhibited a dramatic 46-fold decrease in affinity for the compound compared with SNF. Thus, a bulkier α-carbon substituent had the most dramatic effect (∼50-fold) on NF binding to 5-HT2B receptors, a much lesser (∼10-fold) effect on NF binding to 5-HT2C receptors, and a modest (5-fold) effect on NF binding to 5-HT2A receptors. Effect of Point Mutations on Agonist Potency and Efficacy. For each of the wild-type and point mutant 5-HT2B receptors, we also measured SNF potency (EC50) and relative efficacy compared with the full agonist 5-HT (Emax) (Fig. 8 and Table 4). As was true for ligand affinity, agonist potency was decreased only by the V2.53L and M5.39V mutations (Fig. 8, A–C, and Table 4). In contrast to its effect on SNF affinity at 5-HT2B receptors, the V2.53L mutation in the 5-HT2C receptor did not alter agonist potency (Table 4). This is in line with our finding that SNF affinity was less sensitive to the V2.53L mutation in the 5-HT2C receptor than in the 5-HT2B receptor. The L2.53V mutation in the 5-HT2A receptor caused a dramatic 20-fold decrease in the potency of SNF (Table 4)—a change in the opposite direction than would have been predicted based on a role for residue 2.53 in contributing to the rank order of potency of SNF at 5-HT2 receptors. Only the V2.53L mutation in the 5-HT2B receptor altered the agonist relative efficacy: SNF efficacy was increased 36% by the mutation (Fig. 7, A and B, and Table 4). In terms of RNF potency, the V2.53L mutation in both the 5-HT2B and 5-HT2C receptors increased potency to a similar extent: approximately 2-fold (Fig. 8, A and B, and Table 4). The L2.53V mutation in the 5-HT2A receptor decreased RNF potency by 30-fold (Table 4), an effect similar to that observed for SNF potency. With respect to RNF relative efficacy, as with SNF relative efficacy, only the V2.53L mutation in the 5-HT2B receptor affected the parameter, decreasing it by a dramatic 65% (Fig. 8, A and B, and Table 4). However, although the M5.39V mutation had no effect on agonist efficacy by itself, in tandem with the V2.53L mutation, it eliminated the effect of the latter mutation effect on SNF efficacy and increased its effect on RNF efficacy by ∼1.2-fold (Fig. 8E and Table 4). Emax is reported as % maximum response to 5-HT. p values were obtained from F-tests comparing curve fits of concentration-response isotherms for two receptors. Where applicable, values are presented as mean ± S.E. Competition binding isotherms for several 5-HT2BR agonist ligands at wild-type and V2.53L 5-HT2B receptors. The percentage total binding of ∼1 nM [3H]LSD remaining in the presence of LSD (A), 5-HT (B), α-methyl-5-HT (C), pergolide (D), and dihydroergotamine (DHE, E) is indicated for WT and V2.53L 5-HT2B receptors. Data are presented as the mean ± S.E. of at least three independent experiments measured in duplicate. To obtain log Ki values from these data, the data were fit to a heterologous competition model of radioligand binding to one class of receptor sites that takes ligand depletion into account (GraphPad Prism 4.0). Nonspecific radioligand binding never exceeded 20% of the total radioligand binding. The V2.53A and V2.53I 5-HT2B receptors were assayed and analyzed simultaneously (see Table 2). A, 3-D molecular models showing the results of ligand docking simulations that are consistent with conserved features of biogenic amine ligand binding. Simulated docking of SNF to the model shown in Fig. 3 was performed using the FLEXX module of Sybyl 6.91 software. The solutions consistent with conserved features of biogenic amine ligand binding are shown. A (solution 1), C (solution 2), predicted orientation of SNF relative to conserved residues important for biogenic amine ligand binding. B (solution 1), D (solution 2), space fill representation of predicted docking of SNF relative to Val2.53, in which the terminal methyl groups of Val2.53 and the α-methyl group of SNF are indicated by arrowheads and an arrow, respectively. Atom color code: white, carbon; blue, nitrogen; red, oxygen; cyan, hydrogen; and yellow, sulfur. The α-carbon backbone of the seven helices is shown in purple. B, representative energy-minimized structures from ten rounds of computer-simulated annealing of solution 1 (A and B) and solution 2 (C and D) after insertion of the V2.53L mutation. The results predict, in both cases, one stabilizing van der Waals' interaction between the α-methyl group of SNF (arrows) and the terminal δ-methyl groups of V2.53L (arrowheads). Atom color code: white, carbon; blue, nitrogen; red, oxygen; cyan, hydrogen; and yellow, sulfur. The α-carbon backbone of the seven helices is shown in purple. The main finding reported herein is that Val2.53 in the 5-HT2B receptor contributes to the high-affinity binding of SNF through vdW interactions between both Val2.53 terminal γ-methyl groups and the α-methyl group of the ligand. Of the 11 5-HT2B-to-5-HT2C/2A mutations tested, only the V2.53L (5-HT2B/2C-to-5-HT2A) and M5.39V (5-HT2B-to-5-HT2C/2A) mutations resulted in substantial changes in SNF affinity (Fig. 2 and Table 1). Residue 2.53 in the 5-HT2C receptor is also a valine; however, the V2.53L mutation in the 5-HT2C receptor diminished SNF binding only half as much as it did in the 5-HT2B receptor (Fig. 2 and Table 1). 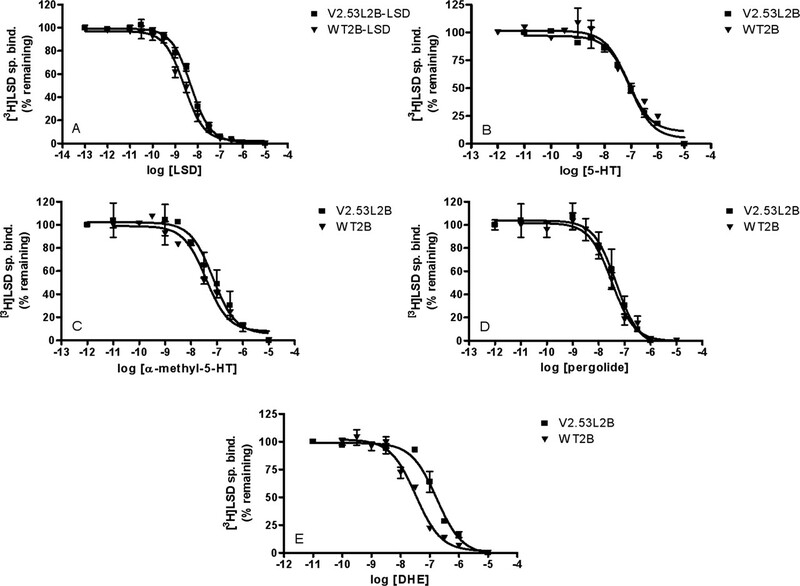 The inverse L2.53V mutation in the 5-HT2A receptor did not affect SNF affinity (Fig. 2 and Table 1), suggesting that interactions between Val2.53 and SNF are more important in 5-HT2B receptors than in 5-HT2C receptors and that Leu2.53 plays no role in SNF binding to the 5-HT2A receptor. Given the rank order of affinity of SNF for 5-HT2 receptors (5-HT2B > 5-HT2C > 5-HT2A), our data suggest that interactions between Val2.53 in the 5-HT2B receptor and the α-methyl group of the ligand contribute to subtype selectivity. To ascertain whether the V2.53L mutation affected the binding of other agonists, we measured the affinity of two tryptamines (5-HT and α-methyl-5-HT) and three ergolines (dihydroergotamine, pergolide, and LSD) at 5-HT2B receptors. The data presented in Table 2 demonstrate that 2.53 mutations in the 5-HT2B receptor did not globally perturb agonist binding. It is noteworthy that LSD (i.e., the radioligand) affinity was altered less than 2-fold. Taken together, the preceding results demonstrate that the effect of the V2.53L mutation is selective for SNF. Representative energy-minimized structure from 10 rounds of computer-simulated annealing of solution 1 after insertion of the V2.53I mutation. The result predicts two stabilizing vdW interactions between the α-methyl group of SNF (arrow) and the terminal methyl groups of V2.53I (arrowheads). A, stick representation; B, space fill representation. Atom color code: white, carbon; blue, nitrogen; red, oxygen; cyan, hydrogen; and yellow, sulfur. The α-carbon backbone of the seven helices is shown in purple. Representative energy-minimized structure from 10 rounds of computer-simulated annealing of solution 1 bearing the V2.53L after addition or removal of SNF α-carbon substituents. A and B, the result predicts a stabilizing van der Waals' interaction between a terminal δ-methyl group of V2.53L (arrowheads) and the α-carbon of α-desmethyl-NF (arrow). C and D, the result predicts a stabilizing vdW interaction between a terminal δ-methyl group of V2.53L (arrowheads) and the α-carbon-proximal methylene group of the α-ethyl substituent of α-ethyl-NF; the terminal ethyl group of the α-ethyl substituent points “down” away from V2.53L. Atom color code: white, carbon; blue, nitrogen; red, oxygen; cyan, hydrogen; and yellow, sulfur. The α-carbon backbone of the seven helices is shown in purple. To explore how Val2.53 might contribute to SNF affinity at 5-HT2B receptors, we performed ligand docking simulations. Of the 30 solutions generated, only two were both consistent with conserved features of biogenic amine ligand binding and predicted SNF to be close enough to Val2.53 for the residue to directly affect binding (i.e., within 4 Å) (Fig. 4). In both of these, the α-methyl group of the ligand was predicted to be near both (solution 1) or one (solution 2) of the Val2.53 terminal γ-methyl groups. After introduction of the V2.53L mutation into each solution and computer-simulated annealing to explore possible side chain orientations relative to the α-methyl group of SNF, both solutions predicted only one vdW interaction (Fig. 4). For solution 2, then, Val2.53 and V2.53L were predicted to interact similarly with the ligand, each contributing one stabilizing vdW interaction. For solution 1, Val2.53 was predicted to contribute two stabilizing vdW interactions and V2.53L was predicted to contribute only one. The energetic cost (i.e., the ΔΔG calculated from the data in Table 1) of the V2.53L mutation on SNF binding was + 1.66 kcal/mol. Others have measured the contribution of methyl group-methyl group interactions to ligand binding energy, with values ranging from +0.4 kcal/mol to +1.4 kcal/mol (Bigler et al., 1993; Huang et al., 1995; Morton et al., 1995; Faergeman et al., 1996; Lu et al., 1997; Oue et al., 1997; Kawaguchi and Kuramitsu, 1998). The value calculated from our data (+1.66 kcal/mol) is thus consistent with the loss of a 2.53 methyl group-SNF α-methyl group vdW interaction caused by the V2.53L mutation, a prediction of our modeling and MD simulations. In addition, the ΔΔG for the V2.53A mutation reveals a +2.94-kcal/mol difference in SNF binding energy compared with the wild type. Thus, removal of the second stabilizing methyl group-methyl group vdW interaction costs +2.94 kcal/mol – (+1.66 kcal/mol) = +1.28 kcal/mol, again consistent with reported interaction energies and further supporting our model predicting two stabilizing vdW interactions between Val2.53 and the α-methyl group of SNF. To further test our modeling and MD simulations, we studied the effect of a V2.53I mutation on 2.53-SNF interactions. Computer-simulated annealing predicted that V2.53I would, like Val2.53, form two stabilizing vdW interactions with the α-methyl group of SNF (Fig. 5). Thus, we predicted that the mutation would not affect SNF affinity. As shown in Table 1, the V2.53I 5-HT2B receptor's affinity for SNF was not significantly different from that of the wild type, in agreement with our modeling and MD simulations. This result validates our computational approach and substantiates the prediction that the α-methyl group of SNF interacts with both terminal methyl groups of Val2.53. Given the apparent importance of the α-methyl group-Val2.53 interaction for SNF binding to 5-HT2B receptors, we measured the affinity of the wild-type and V2.53L mutant receptors for NF analogs bearing α-carbon `mutations.' Assuming that RNF binds in the same orientation as SNF, our model predicts that the α-methyl group of RNF will project down toward the cytoplasmic face of the receptor and the α-H will appose Val2.53. We reasoned that both the increased distance of the α-methyl group from Val2.53 and the smaller vdW radius of the apposing α-H would render RNF much less sensitive to the V2.53L mutation. As shown in Table 3, RNF affinity was indeed decreased only 3-fold by the V2.53L mutation, compared with a 17-fold effect on SNF affinity. Likewise, α-desmethyl-NF also exhibited only a 3-fold decreased affinity at V2.53L 5-HT2B receptors compared with its affinity at the wild-type receptor (Table 3). Thus, the 5-HT2B receptor-selective effect of the V2.53L mutation on NF binding requires the ligand to bear an α-methyl group in the S-(+) configuration; the R-(–) α-methyl group does not seem to contribute to NF binding to the wild-type 5-HT2B receptor—an observation that is consistent with the similar affinities of α-desmethyl-NF, which lacks an α-methyl group, and RNF. We also measured the affinity of α-R,S-(±)-ethyl-NF for wild-type 5-HT2B receptors. We hypothesized that if the α-methyl group of SNF is within 4 Å of either terminal γ-methyl group of Val2.53, an α-ethyl substituent would be poorly tolerated as a result of steric hindrance. As shown in Table 3, the 5-HT2B receptor exhibited a 46-fold decreased affinity for α-R,S-(±)-ethyl-NF compared with SNF, further supporting our model, wherein Val2.53 of the 5-HT2B receptor is within4Åofthe α-methyl group of SNF—close enough for both terminal γ-methyl groups to form stabilizing vdW interactions with the α-methyl group of ligand. In addition, the 5-HT2C and 5-HT2A receptors displayed considerably smaller reductions in α-R,S-(±)-ethyl-NF affinity—14- and 5-fold, respectively (Table 3). One possible explanation for the reduced sensitivity of the 5-HT2C and 5-HT2A receptors to α-carbon mutations in the ligands is that the ligands may bind in a different orientation to the 5-HT2C and 5-HT2A receptors than does SNF to the 5-HT2B receptor. Competition binding isotherms for SNF at V2.53A 5-HT2B receptors. The percentage total binding of ∼1 nM [3H]LSD remaining in the presence of the indicated concentration of SNF is shown. Data are presented as the mean ± S.E. of at least three independent experiments measured in duplicate. To obtain log Ki values from these data, the data were fit to a heterologous competition model of radioligand binding to one class of receptor sites that takes ligand depletion into account (GraphPad Prism 4.0). Nonspecific radioligand binding was never exceeded 20% of the total radioligand binding. SNF congeners (RNF, α-desmethyl-NF, α-R,S-(±)-NF) were assayed and analyzed in parallel (see Table 3). Our studies of NF congener binding to the V2.53L 5-HT2B are also consistent with interactions between Val2.53 and the α-methyl group of SNF. For instance, our modeling and MD simulations predicted the formation of one stabilizing vdW interaction between V2.53L and SNF (compared with two such interactions between Val2.53 and the α-methyl group of SNF). At first glance, one would have expected `removal' of the α-methyl group (i.e., RNF or α-desmethyl-NF) to eliminate the remaining stabilizing vdW interaction, thereby decreasing affinity. However, we observed that RNF and α-desmethyl-NF bound to the V2.53L 5-HT2B receptor with affinities similar to that of SNF. In accord with the previous observations, our modeling and MD simulations suggested that, absent an S-(+) α-methyl group, both V2.53L terminal δ-methyl groups can project into the binding pocket and form at least one stabilizing vdW interaction with the α-carbon of α-desmethyl-NF. Thus, our MD simulations provided a plausible molecular rationale for the observation that SNF, RNF, and α-desmethyl-NF displayed similar affinities at the V2.53L 5-HT2B receptor. Our modeling and MD simulations also provided an explanation for the similar affinities of α-R,S-(±)-ethyl-NF and SNF for the V2.53L 5-HT2B receptor. With α-R,S-(±)-ethyl-NF bound in the pocket, our MD simulations predicted that the V2.53L side chain orients such that one of the V2.53L terminal δ-methyl groups can form a stabilizing vdW interaction; the other terminal δ-methyl group projects away from the ligand, leaving room for the bulkier α-carbon substituent. A much simpler explanation for the effect of the V2.53L mutation on SNF binding to the 5-HT2B receptor is that the mutation results in steric hindrance with some group(s) on the ligand. However, the observations that 1) the bulky V2.53I side chain did not affect SNF binding and 2) generating a larger region of bulk tolerance via a V2.53A mutation resulted in a much larger perturbation of SNF binding than did the V2.53L mutation (i.e., 46-fold versus. 17-fold) argue against the simpler explanation. However, the fact that the wild-type 5-HT2B receptor displays smaller decreases in affinity for RNF and α-desmethyl-NF than that caused by V2.53L mutation on SNF affinity suggests the existence of additional factors. A secondary finding of this study is that Met5.39 also participates in SNF binding. We attempted to explain the role of Met5.39 in SNF binding, as we had for Val2.53, using modeling, ligand docking simulations, and MD simulations. In none of the computer-simulated annealing results, however, was Met5.39 predicted to be less than 10 Å away from bound SNF. A possible explanation for our Met5.39 data that is consistent with our model is that the residue stabilizes, through hydrophobic and/or hydrogen bonding interactions, extracellular loop 2 in the binding pocket in such a way that the loop favorably interacts with bound SNF. Indeed, the analogous dopamine D2 receptor residue (Val5.39) along with extracellular loop 2 probably plays a role in the binding of some ligands (Shi and Javitch, 2004). On the other hand, given its position at the extracellular surface of the receptor, Met5.39 might participate in initial receptor-ligand interactions that guide SNF down into the binding pocket. Concentration-response isotherms for agonist-stimulated inositol phosphate accumulation. 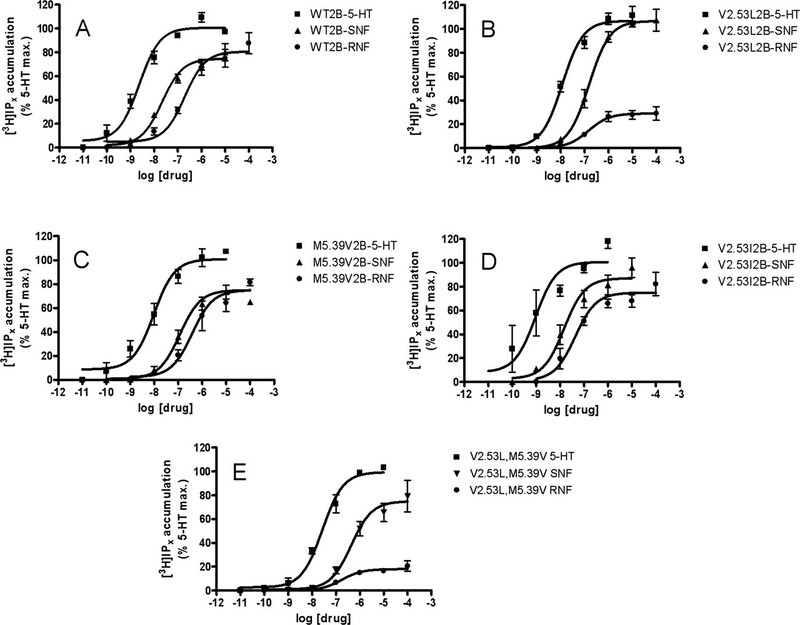 Agonist- and concentration-dependent activation of WT (A), V2.53L (B), M5.39V (C), V2.53I (D), and V2.53L,M5.39V (E) 5-HT2B receptors transiently expressed in HEK293 cells is shown. Data represent the mean ± S.E. of at least three independent experiments measured in duplicate. 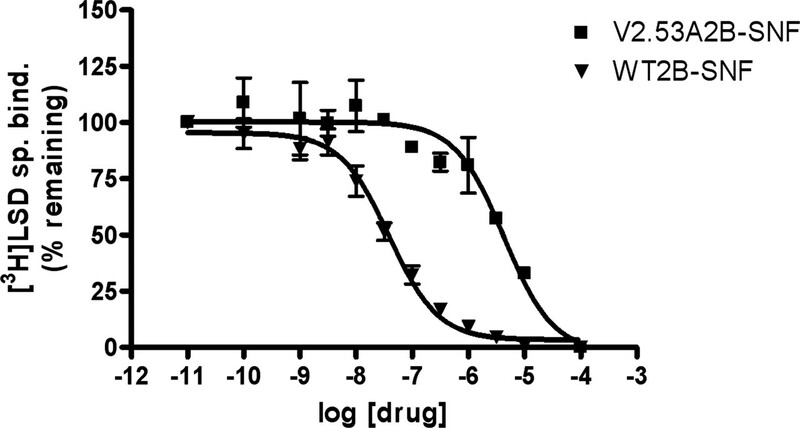 Average baseline and maximal drug-stimulated [3H]IP accumulation (in disintegrations per minute) in wild-type 5-HT2B receptor-expressing cells were: 2700 ± 400 (baseline), 13,000 ± 3000 (5-HT), 10,000 ± 2000 (SNF), and 11,000 ± 2000 (RNF); corresponding values for V2.53L 5-HT2B receptor-expressing cells were: 900 ± 100 (baseline), 13,000 ± 5000 (5-HT), 14,000 ± 5000 (SNF), and 4000 ± 2000. To obtain log EC50 and Emax values from concentration-response data, the data were fit to a three parameter logistic concentration-response model (GraphPad Prism 4.0). Emax is expressed as percent of the maximum response to 5-HT. We also determined SNF potency and efficacy at wild-type and mutant 5-HT2 receptors (Fig. 8 and Table 4). SNF potency, like its binding affinity, was only decreased at V2.53L and M5.39V mutant 5-HT2B receptors (Fig. 8 and Table 4). As for agonist relative efficacy, a unique role for Val2.53 in 5-HT2B receptor activation became apparent (Fig. 8 and Table 5). That is, both SNF and RNF Emax were altered only in the 5-HT2B receptor and only by the V2.53L—not the V2.53I—mutation. In conclusion, we have discovered that residue 2.53—a valine—plays a role in SNF binding to, and activation of, the 5-HT2B receptor that is unique among 5-HT2 family receptors. Our studies suggest the existence of two stabilizing vdW interactions between the terminal methyl groups of Val2.53 and the α-methyl group of SNF in the ligand-bound receptor. These interactions also have consequences on receptor function, because SNF potency and efficacy are both affected when these interactions are perturbed. Thus, vdW interactions between Val2.53 and the α-methyl group of SNF contribute to the subtype selective pharmacology. Targeting these interactions via ligand mutations (e.g., by synthesizing SNF analogs lacking, or bearing bulkier, α-carbon substituents in the S-(+) orientation) may result in a more selective 5-HT2C agonist. Indeed, as we show herein, NF congeners either lacking an α-methyl group or bearing a bulkier α-ethyl substituent exhibit reductions in 5-HT2B—but not 5-HT2C or 5-HT2A—receptor affinity. Similar ligand-receptor interactions that are unique to the 5-HT2B receptor among 5-HT2 receptors are likely to exist for SNF-induced activation as well, and a better understanding of these could guide drug design efforts toward an effective appetite suppressant devoid of VHD- and PH-inducing potential. We are grateful to Richard B. Rothman at the National Institute on Drug Abuse and to the National Institute of Mental Health Chemical Synthesis Program for providing optically-pure SNF and RNF, and to David Larson, David Derrington, William Curtis, and Michael Dolan at Tripos, Inc. for invaluable, expert assistance with the Sybyl 6.91 software. We also thank Wesley Kroeze for assistance with statistical analyses and for the critical reading of our manuscript and Douglas Sheffler for help with image preparation. This work was supported by an American Heart Association predoctoral fellowship (to V.S.) and by National Institutes of Health grants R01-MH57635, K02-MH01366, and the National Institutes of Mental Health Psychoactive Drug Screening Program (to B.L.R.). ABBREVIATIONS: 5-HT, 5-hydroxytryptamine (serotonin); VHD, valvular heart disease; PH, pulmonary hypertension; SNF, S-(+)-norfenfluramine; NF, norfenfluramine; MD, molecular dynamics; vdW, van der Waals; LSD, d-lysergic acid diethylamide; FBS, fetal bovine serum; DMEM, Dulbecco's modified Eagle's medium; RNF, R-(–)-norfenfluramine; 3-D, three-dimensional; CSA, computer-simulated annealing; WT, wild-type; α-H, α-carbon hydrogen substituent. Bhatnagar A, Sheffler DJ, Kroeze WK, Compton-Toth B, and Roth BL (2004) Caveolin-1 interacts with 5-HT2A serotonin receptors and profoundly modulates the signaling of selected Gαq-coupled protein receptors. J Biol Chem 279: 34614–34623. Bigler TL, Lu W, Park SJ, Tashiro M, Wieczorek M, Wynn R, and Laskowski M Jr (1993) Binding of amino acid side chains to preformed cavities: interaction of serine proteinases with turkey ovomucoid third domains with coded and noncoded P1 residues. Protein Sci 2: 786–799. Branch CL, Johnson CN, and Stemp G (2002) inventors; SmithKline Beecham, assignee. Tetrahydroisoquinoline derivatives as modulators of dopamine D3 receptors. U.S. patent 6,465,485. 2002 Oct 15. Brenot F, Herve P, Petitpretz P, Parent F, Duroux P, and Simonneau G (1993) Primary pulmonary hypertension and fenfluramine use. Br Heart J 70: 537–541. Choudhary MS, Craigo S, and Roth BL (1993) A single point mutation (Phe340→Leu340) of a conserved phenylalanine abolishes 4-[125I]iodo-(2,5-dimethoxy)phenylisopropylamine and [3H]mesulergine but not [3H]ketanserin binding to 5-hydroxytryptamine2 receptors. Mol Pharmacol 43: 755–761. Connolly HM, Crary JL, McGoon MD, Hensrud DD, Edwards BS, Edwards WD, and Schaff HV (1997) Valvular heart disease associated with fenfluramine-phentermine. N Engl J Med 337: 581–588. Dengel F, Ehrmann O, Friedrich L, and Zimmermann F (1975) inventors; Knoll A.G. Chemische Fabriken, assignee. Theophylline derivatives. U.S. patent 3,926,995. 1975 Dec 16. Faergeman NJ, Sigurskjold BW, Kragelund BB, Andersen KV, and Knudsen J (1996) Thermodynamics of ligand binding to acyl-coenzyme A binding protein studied by titration calorimetry. Biochemistry 35: 14118–14126. Fitzgerald LW, Burn TC, Brown BS, Patterson JP, Corjay MH, Valentine PA, Sun JH, Link JR, Abbaszade I, Hollis JM, et al. (2000) Possible role of valvular serotonin 5-HT(2B) receptors in the cardiopathy associated with fenfluramine. Mol Pharmacol 57: 75–81. Fuller RW, Snoddy HD, Clemens JA, and Molloy BB (1982) Effect of norfenfluramine and two structural analogues on brain 5-hydroxyindoles and serum prolactin in rats. J. Pharm. Pharmacol. 34: 449–450. Glennon RA, Titeler M, and McKenney JD (1984) Evidence for 5-HT2 involvement in the mechanism of action of hallucinogenic agents. Life Sci 35: 2505–2511. Heisler LK, Cowley MA, Tecott LH, Fan W, Low MJ, Smart JL, Rubinstein M, Tatro JB, Marcus JN, Holstege H, et al. (2002) Activation of central melanocortin pathways by fenfluramine. Science (Wash DC) 297: 609–611. 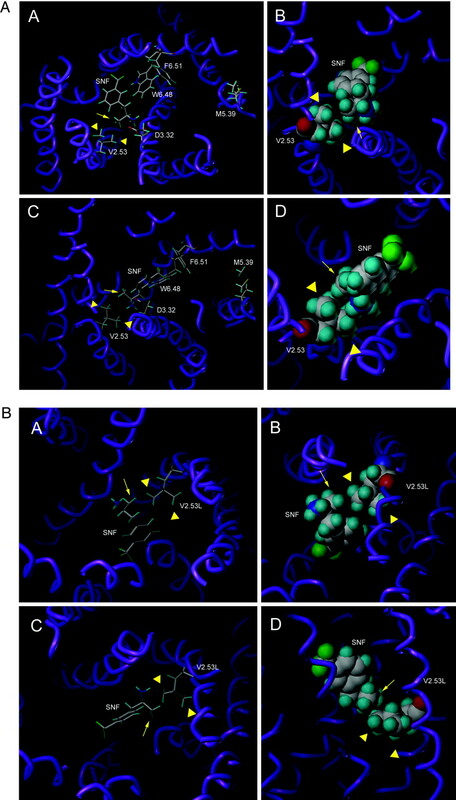 Huang K, Lu W, Anderson S, Laskowski M Jr, and James MN (1995) Water molecules participate in proteinase-inhibitor interactions: crystal structures of Leu18, Ala18 and Gly18 variants of turkey ovomucoid inhibitor third domain complexed with Streptomyces griseus proteinase B. Protein Sci 4: 1985–1997. Kawaguchi S and Kuramitsu S (1998) Thermodynamics and molecular simulation analysis of hydrophobic substrate recognition by aminotransferases. J Biol Chem 273: 18353–18364. Kristiansen K, Kroeze WK, Willins DL, Gelber EI, Savage JE, Glennon RA, and Roth BL (2000) A highly conserved aspartic acid (Asp-155) anchors the terminal amine moiety of tryptamines and is involved in membrane targeting of the 5-HT(2A) serotonin receptor but does not participate in activation via a “salt-bridge disruption” mechanism. J Pharmacol Exp Ther 293: 735–746. Kroeze WK, Kristiansen K, and Roth BL (2002) Molecular biology of serotonin receptors structure and function at the molecular level. Curr Top Med Chem 2: 507–528. Kroeze WK, Sheffler DJ, and Roth BL (2003) G-protein-coupled receptors at a glance. J Cell Sci 116: 4867–4869. Launay JM, Herve P, Peoc'h K, Tournois C, Callebert J, Nebigil CG, Etienne N, Drouet L, Humbert M, Simonneau G, et al. (2002) Function of the serotonin 5-hydroxytryptamine 2B receptor in pulmonary hypertension. Nat Med 8: 1129–1135. Lu W, Apostol I, Qasim MA, Warne N, Wynn R, Zhang WL, Anderson S, Chiang YW, Ogin E, Rothberg I, et al. (1997) Binding of amino acid side-chains to S1 cavities of serine proteinases. J Mol Biol 266: 441–461. Manivet P, Schneider B, Smith JC, Choi DS, Maroteaux L, Kellermann O, and Launay JM (2002) The serotonin binding site of human and murine 5-HT2B receptors: molecular modeling and site-directed mutagenesis. J Biol Chem 277: 17170–17178. Meltzer HY (1989) Clinical studies on the mechanism of action of clozapine: the dopamine-serotonin hypothesis of schizophrenia. Psychopharmacology 99 (Suppl): S18–S27. Menicagli R and Samaritani S (1996) 1,4-Conjugate addition of the Reformatsky reagent to α-nitrostyrenes: a new synthesis of γ-nitroesters. Tetrahedron 52: 1425–1432. Morton A, Baase WA, and Matthews BW (1995) Energetic origins of specificity of ligand binding in an interior nonpolar cavity of T4 lysozyme. Biochemistry 34: 8564–8575. Moses PL and Wurtman RJ (1984) The ability of certain anorexic drugs to suppress food consumption depends on the nutrient composition of the test diet. Life Sci 35: 1297–1300. Neill JC and Cooper SJ (1989) Evidence that d-fenfluramine anorexia is mediated by 5-HT1 receptors. Psychopharmacology (Berl) 97: 213–218. Nichols DE (2004) Hallucinogens. Pharmacol Ther 101: 131–181. Oue S, Okamoto A, Nakai Y, Nakahira M, Shibatani T, Hayashi H, and Kagamiyama H (1997) Paracoccus denitrificans aromatic amino acid aminotransferase: a model enzyme for the study of dual substrate recognition mechanism. J Biochem (Tokyo) 121: 161–171. Palczewski K, Kumasaka T, Hori T, Behnke CA, Motoshima H, Fox BA, Le Trong I, Teller DC, Okada T, Stenkamp RE, et al. (2000) Crystal structure of rhodopsin: A G protein-coupled receptor. Science (Wash DC) 289: 739–745. Pouwels HM, Smeets JL, Cheriex EC, and Wouters EF (1990) Pulmonary hypertension and fenfluramine. Eur Respir J 3: 606–607. Roth BL, Baner K, Westkaemper R, Siebert D, Rice KC, Steinberg S, Ernsberger P, and Rothman RB (2002) Salvinorin A: a potent naturally occurring nonnitrogenous kappa opioid selective agonist. Proc Natl Acad Sci USA 99: 11934–11939. Roth BL, Shoham M, Choudhary MS, and Khan N (1997) Identification of conserved aromatic residues essential for agonist binding and second messenger production at 5-hydroxytryptamine2A receptors. Mol Pharmacol 52: 259–266. Roth BL, Willins DL, Kristiansen K, and Kroeze WK (1998) 5-Hydroxytryptamine2-family receptors (5-hydroxytryptamine2A, 5-hydroxytryptamine2B, 5-hydroxytryptamine2C): where structure meets function. Pharmacol Ther 79: 231–257. Rothman RB, Baumann MH, Savage JE, Rauser L, McBride A, Hufeisen SJ, and Roth BL (2000) Evidence for possible involvement of 5-HT(2B) receptors in the cardiac valvulopathy associated with fenfluramine and other serotonergic medications. Circulation 102: 2836–2841. Setola V, Hufeisen SJ, Grande-Allen KJ, Vesely I, Glennon RA, Blough B, Rothman RB, and Roth BL (2003) 3,4-methylenedioxymethamphetamine (MDMA, “Ecstasy”) induces fenfluramine-like proliferative actions on human cardiac valvular interstitial cells in vitro. Mol Pharmacol 63: 1223–1229. Shapiro DA, Kristiansen K, Kroeze WK, and Roth BL (2000) Differential modes of agonist binding to 5-hydroxytryptamine2A serotonin receptors revealed by mutation and molecular modeling of conserved residues in transmembrane region 5. Mol Pharmacol 58: 877–886. Shapiro DA, Kristiansen K, Weiner DM, Kroeze WK, and Roth BL (2002) Evidence for a model of agonist-induced activation of 5-hydroxytryptamine 2A serotonin receptors that involves the disruption of a strong ionic interaction between helices 3 and 6. J Biol Chem 277: 11441–11449. Shi L and Javitch JA (2004) The second extracellular loop of the dopamine D2 receptor lines the binding-site crevice. Proc Natl Acad Sci USA 101: 440–445. Simonneau G, Fartoukh M, Sitbon O, Humbert M, Jagot JL, and Herve P (1998) Primary pulmonary hypertension associated with the use of fenfluramine derivatives. Chest 114: 195S–199S. Steffee CH, Singh HK, and Chitwood WR (1999) Histologic changes in three explanted native cardiac valves following use of fenfluramines. Cardiovasc Pathol 8: 245–253. Tomita T and Zhao Q (2002) Autopsy findings of heart and lungs in a patient with primary pulmonary hypertension associated with use of fenfluramine and phentermine. Chest 121: 649–652. Vickers SP, Dourish CT, and Kennett GA (2001) Evidence that hypophagia induced by d-fenfluramine and d-norfenfluramine in the rat is mediated by 5-HT2C receptors. Neuropharmacology 41: 200–209. Weintraub M, Sundaresan PR, Schuster B, Moscucci M, and Stein EC (1992) Long-term weight control study. III (weeks 104 to 156). An open-label study of dose adjustment of fenfluramine and phentermine. Clin Pharmacol Ther 51: 602–607.